This is a country less visited by travellers, but it offers a host of surprises to the adventurous visitor. Arrival at Dhaka international airport. Our representative will meet you and transfer you to your hotel. 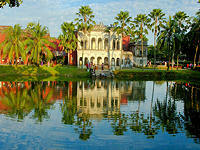 Dhaka, the Capital of Bangladesh, founded in 1608 has an exciting history and rich cultural heritage. 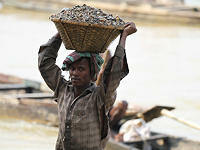 It is intersected by the rivers Buriganga. The total area of the city is approximately 1400 sq. km., with a population of 10 million. It was adorned with the glory of being the capital of the region when it was successively under the Mughal and then British rule. 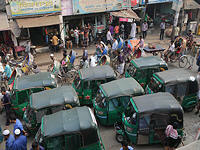 It used to be known as the city of mosques and is called the city of rickshaws. These days it looks more chaotic with more vehicles running and buildinga being constructed. Paintings adorning buses and rickshaws are of people's dreams, and the city is really bustling. Overnight at Dhaka. After an early breakfast a whole day city sightseeing tour inclusing the old part of the city, Sadarghat waterfront, Star mosque, Dhakeshwari Temple, Shakhari bazaar (hindu street), National Language monument, Curzon hall etc. Lunch & dinner in a local restaurant and back to hotel in the evening for overnight. 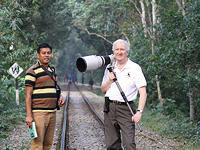 After breakfast at around 07:00hrs checkout from hotel and travel to Sylhet by first class a/c train. Upon arrival check-in to hotel for lunch and spend the rest of the day sightseeing in and around resort / tea garden. Greater Sylhet the land of two leaves and a bud, the major tea plantation area and the home of the Monipuri, Khasia and Garo tribal people. This is located in the gentle sloping upland in the picturesque valley between the Khasia-Jaintia and Tripura Hills, amid scenic tea plantations and lush green tropical forests. 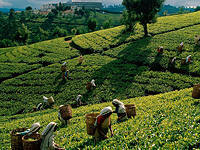 Gentle slopes, congenial climate and abundant rainfall made Sylhet one of the largest tea producing areas in the world. The Monipuri tribes are famous for their Monipuri dance and weaving. After breakfast at the hotel, drive to the north and visit the border town Tamabil and adjoining Jafflong area. These places are close to the Indian border on the north. A beautiful river flows between the hills between the two countries. You can visit some waterfalls in the hills of the Indian side. Back to the hotel in the evening for dinner and overnight. After breakfast at the hotel drive to Sreemangal (the drive will take around 2.5 hrs), arriving about 11:00. Check-in to hotel. Sreemangal, on the south of Sylhet is renowned as the tea Capital. Tea gardens are spread over as far as your eyes can view over the slopes and plains like a canvas of green smooth carpet. It can boast of the three largest gardens of the world. After lunch your guide will take you to visit the Tea gardens, & Khasia Tribal villages. Overnight at the hotel. After an early breakfast drive to Dhaka, en-route visiting the Satchari reserve forest and “Sonargaon” the old capital of Bengal. Sonargaon means golden city, 27 km to the east of Dhaka city, and was the capital of Bengal from 13th to early 17th century during the Chandra and Deva dynasty. The Panam was a flourishing city in those days. In 1611 the Mughals considered the location too exposed to the Portuguese and the Mogh pirates and thus established Dhaka as their capital. It was a centre both for weaving of the muslins and export to different parts of the world, although muslin cannot be found now. After lunch (picnic / local restaurant) drive back to Dhaka. The afternoon will be free to for shopping and exploring the city on your own. After a leisurely breakfast at the the hotel, transfer to airport for your return flight.